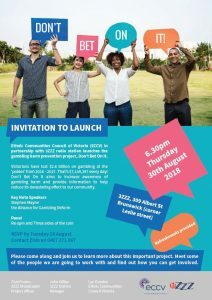 Ethnic Communities Council of Victoria (ECCV) in partnership with 3ZZZ radio station launches the gambling harm prevention project, Don’t Bet On It. Victorians have lost $2.6 billion on gambling at the ‘pokies’ from 2016 – 2017. That’s $7,149,397 every day! Don’t Bet On It aims to increase awareness of gambling harm and provide information to help reduce its devastating effect to our community. Please come along and join us to learn more about this important project. Meet some of the people we are going to work with and find out how you can get involved.